Incase you haven't noticed by all the beach related photos on my Instagram feed and this post last week, the beach is my happy place. It doesn't really matter which beach, as long as its a nice sunny day and I can sit and chill out then I'm there. If the waters a nice temp and not too choppy thats always a bonus too. I'm loving the fact that I get to spend more time at the beach now while I'm on extended maternity leave. The best part is I get to take my little buddy along with me. Of course going to the beach with a toddler in tow requires a lot more planning than a spur of the moment road trip to go lay on the sand for a few hours. It also requires a lot more stuff, because little people need lots of stuff to go anywhere. 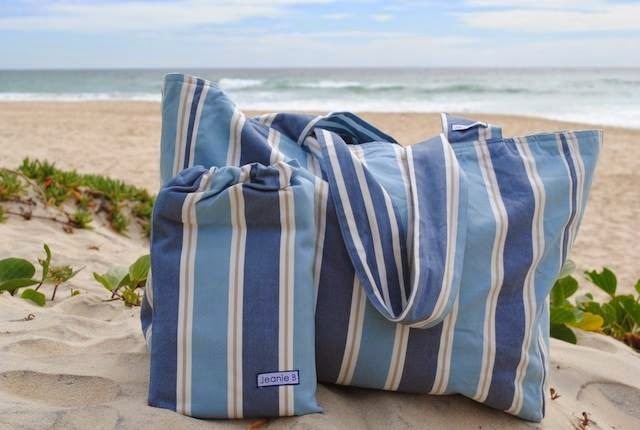 The most important item required when going to the beach is a good beach bag. When you have kids a quality beach bag is a must because you really don't want to have to carry all their stuff around yourself. I used to make do with a Country Road canvas tote bag, but they're simply not big enough to hold everything I need now, so I've upgraded to a Jeanie B beach bag. I chose the denim stripe bag because lets face it jeans are my favourite type of clothing so it goes without saying I'd be attracted to a denim look bag. The bag is available in a number of different colours, with new styles added regularly. Each bag is also fully reversible so its like getting two bags for the price of one, mine has a navy and white stripe on the other side. 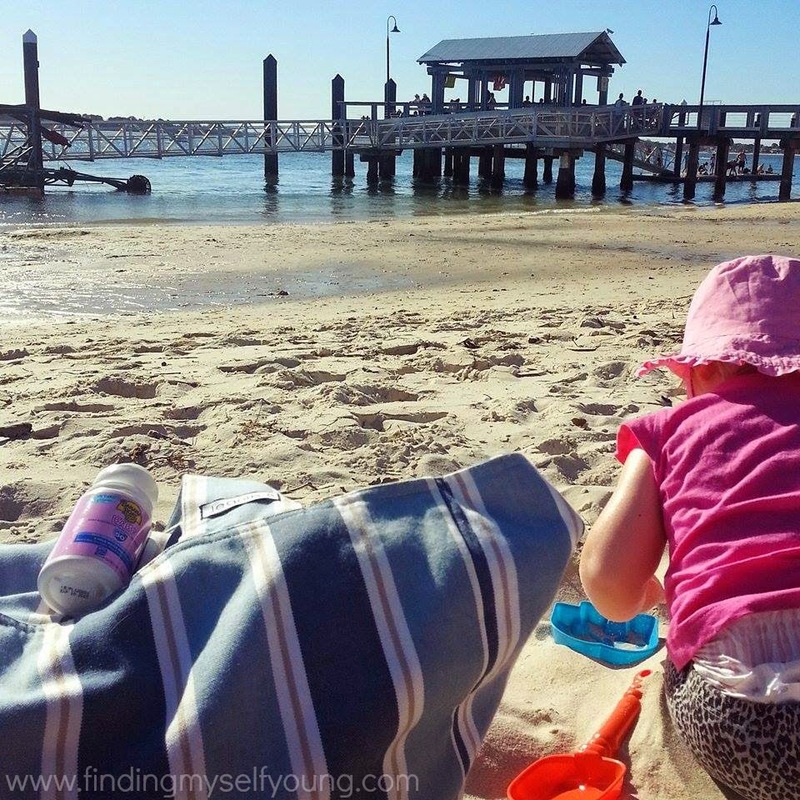 We recently went to Bribie Island for a day trip and we needed to pack even more than usual as we were going for a few hours. The new bag came in really handy as I didn't want to take her nappy bag as well. 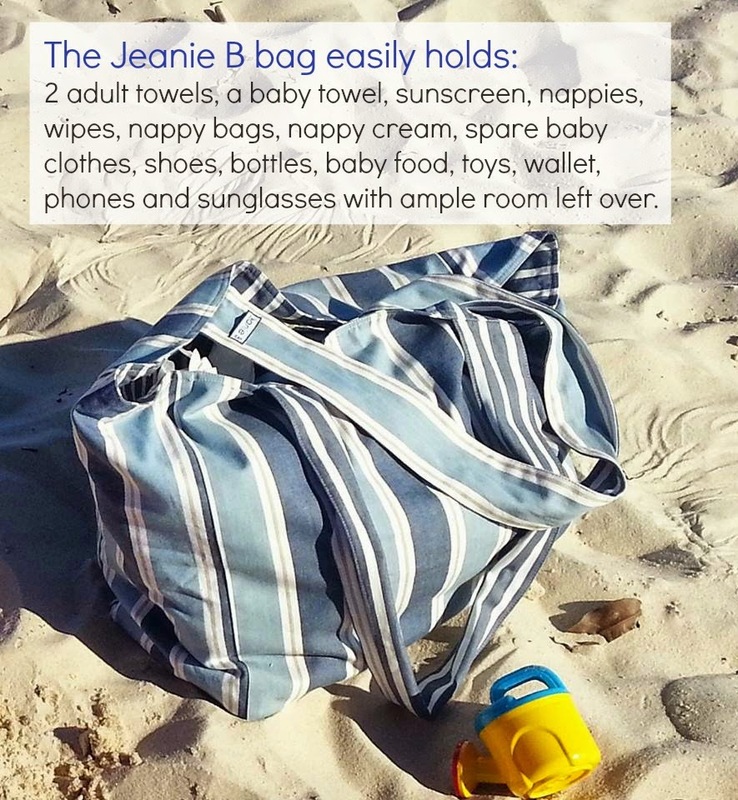 The Jeanie B beach bag is huge so it easily fit everything we needed for the day for her and both of us and still had ample room left. The only let down when carrying baby items, as opposed to a purpose built bag, is that there's no separate internal zip up compartment to store nappy change supplies. It wasn't a real drama though as there's a large internal pocket so I just put her nappies, wipes, nappy bags and cream in there to separate them from our other items. The beach bag is 100% cotton and can be machine washed. I haven't had to wash mine yet, but I love that it can be run through the machine because its bound to get dirty at some point when little grubby sand covered hands go searching for a bottle or the like. At only $59 the Jeanie B beach bag is definitely a worthy investment, especially if you go to the beach as often as we do! There's also a smaller version available (the Jeanie B B-Tween) for $39 if you don't need a bag that's quite so huge. Jeanie B also stock a range of beachwear clothing and jewellery online. Do you go to the beach as often as us? Disclosure - I was gifted a Jeanie B beach bag for the purpose of review. As always all opinions expressed in this review are based on my experience with the product. I am SO jealous of people who live near the beach. We are in the Blue Mountains in NSW, so a beach trip is hours away! We are about half an hour from the beach. I'd hate to live hours from the beach (although having said that I have driven an hour and a half to go to the beach up the coast, but thats for an all day trip). If only it weren't so cold in Melbourne right now. I'd love a day at the beach. Loving that bag too! Yea whats the go with it being freezing down there at the moment? Didn't Melbourne get the memo that its spring already... It already feels like summer here in QLD most days. Yea its huge, I could smuggle Hayley in it! Wow that is a massive bag! I generally use enviro bags but they just don't fit enough in them once you add towels. The beach we visit quite regularly though has a car park close to the tables etc so we tend to leave everything we don't need in the car anyway! I'm too lazy to push the pram all the way back to the car to get stuff lol especially when it means trying to wrangle her back in the pram in the first place considering I'm usually by myself with her. Aint nobody got time for that with a 14 month old haha. Now that looks like a great beach bag. I'm on the look out for one for this season. Can't wait to get the kids to the beach. It's a great bag, infact I like it more than the Country Road ones and I used to work for CR! We love the beach. Especially when holidaying. Lovely bags! All our holidays are always near the beach too! Definitely. She really wasnt happy when we we're leaving, pretty sure she would've stayed there all day if we'd let her.